My friend raised his eyebrows when I casually mentioned to him that most of the Thai dishes I make at home were not what you usually found on most Thai restaurants’ menus. “What do you eat?” My friend asked. His eyebrows went all the way up to the hairline now, rendering the forehead almost nonexistent. Take, for example, Pad Thai. Remove that from a Thai’s diet and, as my friend figured, that Thai would be as good as dead. Pad Thai? Hardly. Take this simple green mango salad from me, though, and watch my soul wither and die. We love green mangoes over there in Thailand. They are innumerable in variety. Some varieties are meant to be eaten right out of hand. Some are meant to be eaten with a sweet dipping sauce. Some taste best preserved or pickled. 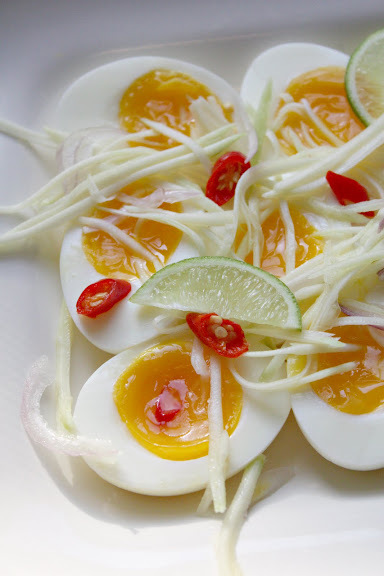 The very, very tart ones are usually grated into long, thin strips and turned into a ridiculously simple, yet extremely delicious and versatile salad – green mango salad. Yam Mamuang (ยํามะม่วง), is usually not served by itself as a salad course; it is served more as a condiment. The tart, salty, hot, mildly sweet flavor combination makes this fresh salad perfect as a side for crispy fried or grilled meats, most common of which is deep-fried flaked catfish, Pla-duk Fu (ปลาดุกฟู). 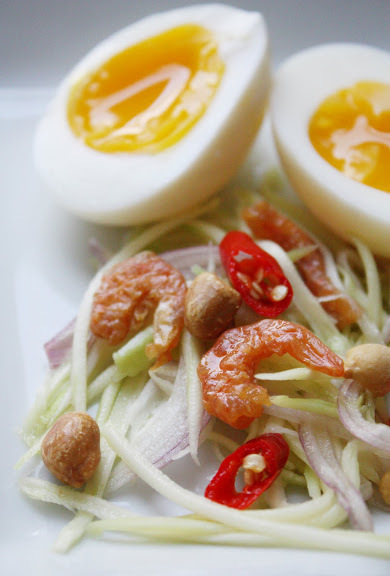 Personally, I like to pair Yam Mamuang with simple boiled eggs. The eggs must be cooked to the point that is right in the middle between soft-boiled and hard-boiled. The Thai people label eggs boiled to this exact degree of doneness “ไข่ต้มยางมะตูม” or “ไข่ยางมะตูม,” likening the consistency of the yolks to the viscous resin/gum of the bael fruit (the มะตูม in ไข่ยางมะตูม). On the outside, medium-boiled eggs look exactly like hard-boiled eggs; that is to say, the whites are tender, yet cooked and hold their shape. But once you split them open, you see creamy golden yolks which aren’t nearly as runny as those of soft-boiled eggs. That’s perfect. That’s what I like. That’s what a lot of people like. Take the eggs out of the refrigerator and leave them out while waiting for the water to boil. Bring a pot of water, with a large pinch of salt added, to a boil. Gently lower the eggs into the boiling water with a soup ladle (this minimizes the impact in terms of blunt trauma and temperature difference). You will need to turn up the heat to maintain the rolling boil. Boil, uncovered, for exactly 7 minutes for large eggs [Added September 23, 2013: chicken eggs. For duck eggs, boil exactly 8 minutes per this post). (Don’t estimate the time. Never guess. Use a timer. Please.) Stir the eggs occasionally to make sure the yolks stay in the middle. Immediately remove the pot from heat and drain off the water. Fill the pot with fresh water from the faucet to cool off the eggs then drain off the water; repeat. The eggs are now ready to be used. 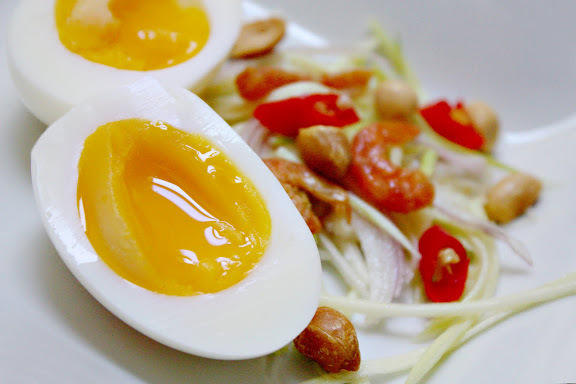 Serve the green mango salad on top of the medium-boiled eggs. These and a plate of steamed jasmine rice make for a fine, fine meal. In fact, as far as I’m concerned, Pad Thai has got nothing on it. *Best places to get these mangoes are South and Southeast Asian grocery stores. Choose ones that are very, very firm. They must be rock hard, in fact. When you lightly squeeze one, it should not yield at all. Also, the skin should be taut and shiny, not wrinkly or spotted. Room temp eggs, right? Otherwise wouldn’t they break when they hit the hot water? Lovely eggs! We recently started cooking eggs like this for adding to ramen. I can’t get enough of them. Liz – Interestingly enough, I haven’t had any incidents of broken eggs even with cold eggs from the fridge. The one time that one egg broke was because I dropped it too hard into the hot water and it hit the bottom of the pot. But, yeah, in theory, you would think cold eggs should crack once they hit the hot water, right? Liz – Now that I think about it, what I do is I take the eggs out of the fridge and set them on the counter top while waiting for the water to boil. The eggs are still colder than room temperature at that point, but at least they don’t go directly from the fridge to the pot. Will add this to the instructions. Thanks for bringing it up. Those eggs are unreal!!! :) The yolk is so perfectly centred, so creamy-looking and the colour is so bright orange. I wonder what they feed these hens with!? I absolutely love green mango yams. When I was in Thailand, I’d much rather have it over the green papaya ones because of that lovely tartness (ah, I remember the yams at “Ortocourt” in front of chatuchak! the first time I tried it, I just saw many people get it, so I pointed and said:”that” I would have never guessed it was mango!). But then, I’ve tried buying green mangoes here is Spain and they taste completely different! I would like to ask you if there is a particular type of mango used for this in Thailand, or any green mango will do (just in case it is that and if I find the right one, I don’t let it go!). Thank you in advance! Choose ones that are still firm and green. I doubt you’ll find them in Spain, though. 🙁 So far, the only good green mangoes I have been able to find are the varieties found in Indian grocery stores. The ones found in mainstream grocery stores are okay to use, but they’re bland and tasteless. Lots of lime juice is needed. Can you share your tips and tricks? Sorry. No foolproof method to share. Unfortunately, the fresher the eggs, the harder it is to peel them. Some of the tricks I’ve tried work well, but usually with older eggs. A friend told me that leaving your eggs out at room temp overnight before you boil them help “age” fresher eggs making them easier to peel. I haven’t tried that, but you may want to. This dish sounds like the perfect meal, you have your protein your vegetables. I love the simplicity that lets the flavors of the ingredients shine through. I have read that vinegar achieves the same effect as salt in the water. Have you tried that substitution yet? Thank you! I’m a big fan of “doing simple things well,” and I agree, this is the PERFECT way to make medium-boiled eggs. The yolk was creamy and not powdery like hard-bioled eggs and not runny like undercooked. I used to only get this done in an egg cooker. I always love eggs this way and I usually eat them with hot sauce and little salt. Delicious! I’d love to try the green mango salad. I’m still waiting for my yearly supply of manila mangoes to use for this recipe. Bookmarked this. If you don’t want your eggshells to crack, but also don’t want to use vinegar or salt in your boiling water, prick the large end of the egg with a large pin (a hatpin or something similar), just deep enough to penetrate the shell. This allows the air in the large end of the egg to escape as it heats and expands instead of cracking the shell to escape, thus negating the need to add things to your water. Just don’t prick too far into the egg, or you will puncture the membrane separating the air pocket from the egg white, and all your egg white will come out of the hole into your boiling water. My mum has this thing called an Egg Prick which has a needle for poking the egg inside a plastic cover so you don’t poke it too far in. I love medium boiled eggs! Thanks for the exact directions!! The best mango salad is in Chiang Mai, Walking Street Market. Lots of nampla, shallots, chile, peanuts and anchovies :D. The flavours are loud and strong, it is a yum on it’s own, definitely not a condiment. Anonymous – Is it possible you are referring to Tam Mamuang (ตำมะม่วง as opposed to ยำมะม่วง) – a variation of Som Tam that uses grated green mangoes in lieu of green papaya? Yeah, that would be something you serve as a stand-alone salad. Featured here, however, is the simple salad served as a side dish or condiment. Its simplicity is intentional as you don’t want to obliterate the flavor of the core protein with which it’s served. Now that’s what I call a PERFECTLY boiled egg! Thanks. My eggs came out perfect. Thank you for this. Woah, this is the only way to cook eggs! I just had the best eggs of my life. Thanks for this amazing and simple cooking technique.